Get a view of Central Oregon’s dramatic scenery from above with Big Sky Balloon Company. Offering both hot air balloon rides and aerial advertising, Big Sky Balloon Company flies in their distinctive, custom hand painted balloon and has maintained a perfect safety record since the company first opened in 1993. 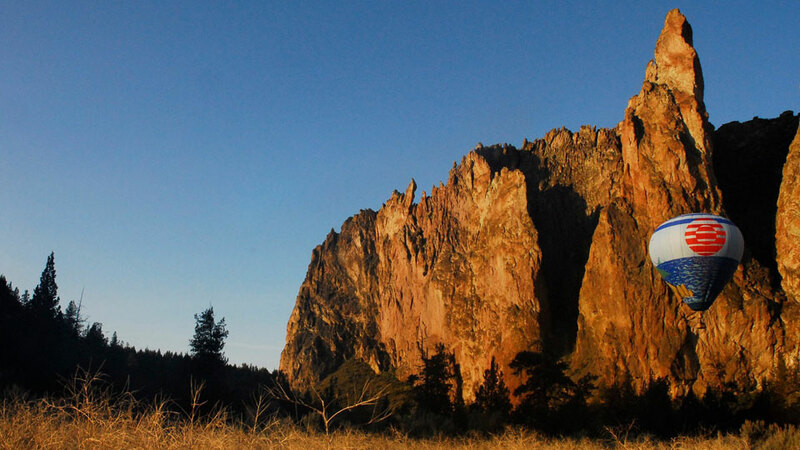 They conduct one balloon tour daily within one hour of sunrise from Smith Rock Ranch, the rock climbers’ paradise in Terrebonne, with flight times varying with the time of year and only when the weather and wind conditions are favorable. Flight time is about an hour, following a short safety briefing and the inflation of the balloon. Total time of the experience is three hours, including the shuttle back to the launch site where a sparkling cider toast awaits. The balloon can carry up to six passengers per flight and guests are welcome to help with balloon inflation and takedown for a true hands on experience. Private charters are also available, along with flights from their private launch site on the Crooked River Canyon that includes a post-flight brunch, private art showing, and luxury accommodations at Panacea at the Canyon.